Lignin as a substitute for diesel fuel is derivative waste from agricultural and forestry production, which does not need any dedicated cultivation and is regenerated at a rate of 50 billion tons per year on the Earth. Therefore, lignin does not have resource supplies constraint or cost concern. Taken into account cellulose pulp as a byproduct in lignin production, the actual cost of lignin is almost zero. In the technical report titled Alternate-fuel studies for diesel engines, the authors of Alabama University, Djordjevic, M.S. and Douglas, G.W., introduced a method of producing various mixtures containing lignin, diesel fuel, and alcohols. In the method, butanol is used to dissolve lignin first, and then taking advantage of butanol’s solubility in diesel to make lignin to dissolve indirectly into diesel. However, because of limited solubility for lignin in butanol, the actual soluble lignin in diesel is less than 2%. In order to fully and economically use such renewable, abundant and unlimited lignin resource, the above-mentioned authors proposed to avoid using the costly butanol; instead, they came up with a direction for future research and development in mixing powdery lignin directly into diesel, and had simultaneously pointed out the technical issues in producing stable mixtures of lignin and diesel. This article presents a stable and uniform mixture of a phyisically and chemically modified lignin and diesel, reports the test results of using the mixture in diesel engine, and confirms that lignin can be an effective substitute for diesel. Regarding feasibility of alternative renewable energy, the major challenge at present is not of technical issues, but of concerns in both insufficient resource supplies and high cost. For example, grain-based ethanol fuels consume a great amount of grain, which competes with human for food and land. In addition, the cost of cellulose ethanol fuel stays high. 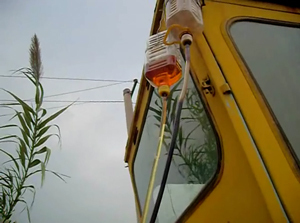 Moreover, the bio-diesel made from soybean oil, rapeseed oil or tree fruit seed oil, not only competes with human for edible oil and land, but also has very limited output, and therefore can just be used as a supplement in small amount for transportation fuel. In order to avoid the aforementioned disadvantages of cellulose ethanol fuel and bio-diesel, algae for oil becomes one of the most popular topics once again, but the large scale production of commercial algae fuel is still out of the question, unless the production cost can be significantly reduced. Lignin as a substitute for diesel fuel  is derivative waste from agricultural and forestry production, which does not need any dedicated cultivation and is regenerated at a rate of 50 billion tons per year on the Earth. Therefore, lignin does not have resource supplies constraint or cost concern. Taken into account cellulose pulp as a byproduct in lignin production, the actual cost of lignin is almost zero. The industrial chain of lignin substitution for diesel will involve at least the fields of agriculture, forestry, paper pulp manufacturing, and transportation fuels. Therefore, lignin has its unique and inherent advantages in terms of economic costs and social benefits. To verify the validity of lignin substitution for diesel, the following presents some preliminary data on real operational engines. Lignin raw material is purchased from the market. Experiments have shown that there is no obvious difference in the subsequent processing and the experimental results among different lignin raw materials produced from different manufacturers. Here come the steps to make lignin colloid: (a) dissolve 2000 grams of lignin raw material into 2 liters of water, and filter out impurities; (b) add sulfuric acid solution of 20% density into the solution to adjust its PH value to be 3; and (c) after 24-hour precipitation, then remove the water at the upper layer of solution to generate the lignin colloid. The lignin colloid, after being completely dehydrated using some specially-made equipment and reagents, can be evenly mixed with diesel to have an emulsified mixture. In our tests with diesel engines, pure diesel from the market was used with the lignin content adjusted to the needed amount. The diesel engine used in the tests has its combustion chamber of the swirl combustion chamber of S195 model, with rated power 10.6kw, nominal rotational speed 2200rpm. 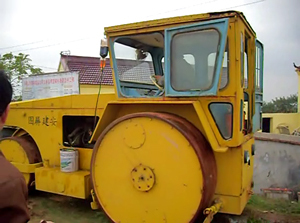 The generator, connected with the diesel engine via a belt, has a power of 8kw. The generator is loaded with three identical ordinary electric stoves, each of which works as the load for each of the generated single-phase electricity power. In the experiment, the generator's output voltage was maintained constant through steadily adjusting the engine's throttle, and the engine’s rotational speed and output were maintained constant under the same load. Each testing interval is about 10 minutes. 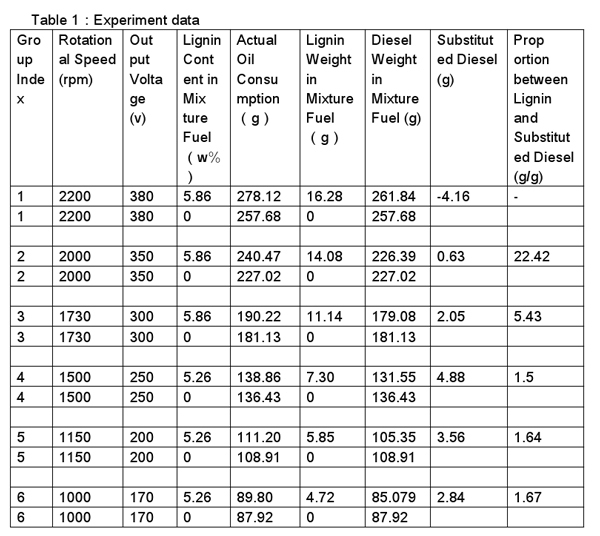 As Table 1 shows, when the engine runs at a speed higher than 2000 rpm, the lignin does not take positive effect, instead, it even undermines the engine's operating condition and causes more diesel consumption. However, when the engine runs at a speed equal to or less than 2000 rpm, the lignin can take effect partially. The slower the engine runs, the higher the substitution effect becomes. At the optimal condition, about every 1.5 grams (tons) of the lignin can take effect equivalent to 1 gram (ton) of pure diesel. The above results imply that lignin combustion is ignited by high temperature and pressure air after the lignin is first gasified by compressed air of high temperature. Since the gasification process takes some time, the lignin takes longer than the pure diesel to combust completely inside the cylinder of a diesel engine. As a result, the efficiency of lignin substitute for diesel, or the unit substitution weight of lignin for diesel, is correlated to the diesel engine's rotational speed. The slower the rotational speed is, the higher the substitution efficiency becomes, because the fuel mixture stays longer in the cylinder for better combustion. The results also indicate that lignin substitute for diesel is more suitable for diesel engines of middle or low speed. Of course, further modifiying the lignin to further smaller sizes will also be able to enhance its combustibility and thus correlates to a higher engine’s rotational speed. Since lignin combustion process involves pre-combustion gasification of lignin, lignin takes longer to combust completely than the pure diesel does inside the cylinder of a diesel engine. This phenomenon results in lignin substitute for diesel being more suitable for diesel engines of middle or low speed. Caidong Qin, “Lignin fuel technology”, June 2009. 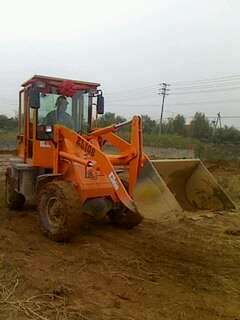 Thanks to Lu An municipal government for providing funds and site for the project’s initial development. Thanks to Innovation Center of Hi-tech Development Zone, MaAnShan for incubating funds and site, and to Anhui Science and Technology Agency for funding support to the project.